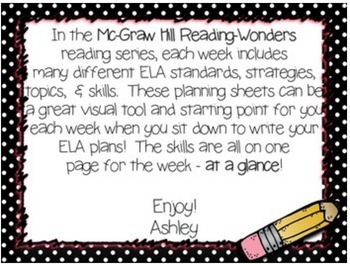 The new McGraw-Hill Reading Wonders reading series introduces several skills and strategies throughout any given week in each unit. 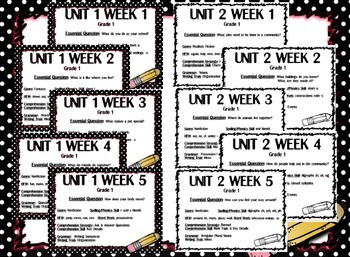 This set has a Week at a Glance planning page for each week of all 6 units for 1st grade. If you need something to help you zoom out and see the big picture of the week, these Week at a Glance planning pages are for you! They will be a great planning tool to see your skills and strategies of the week at a glance as you sit down to write your ELA plans! 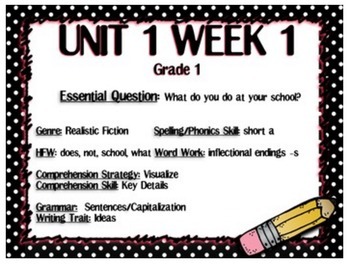 They will also be great cover pages to put in my ELA plan binders to use as dividers for each week of the unit. 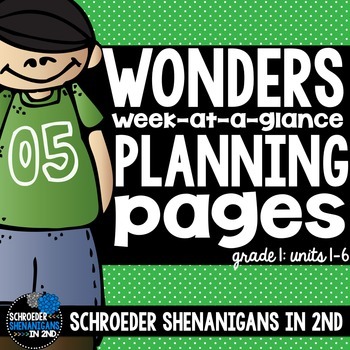 You can, then, just add your plans and activities behind each week's planning page! I hope this tool helps you to plan Reading Wonders more easily like it has helped me! Don't forget to leave feedback!! I would LOVE to hear from you!